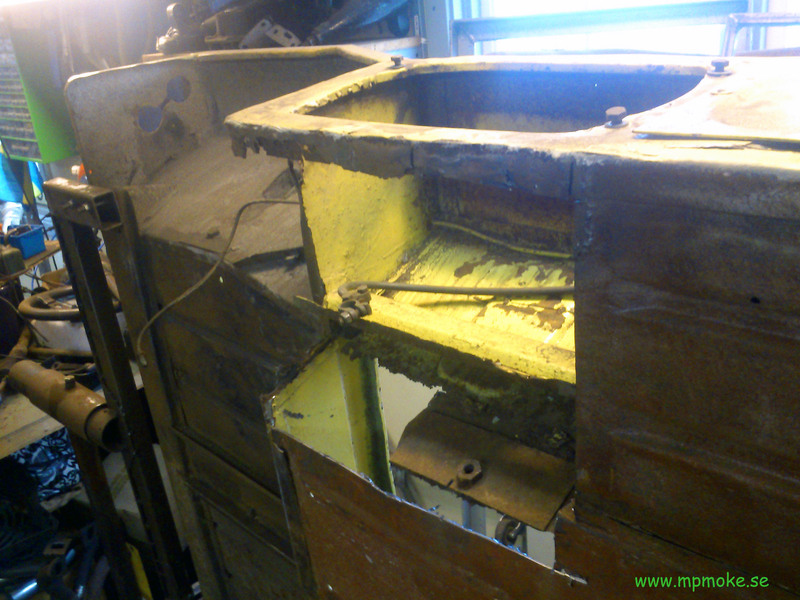 This entry was posted in Technical and tagged rust Moke on February 22, 2014 by admin. 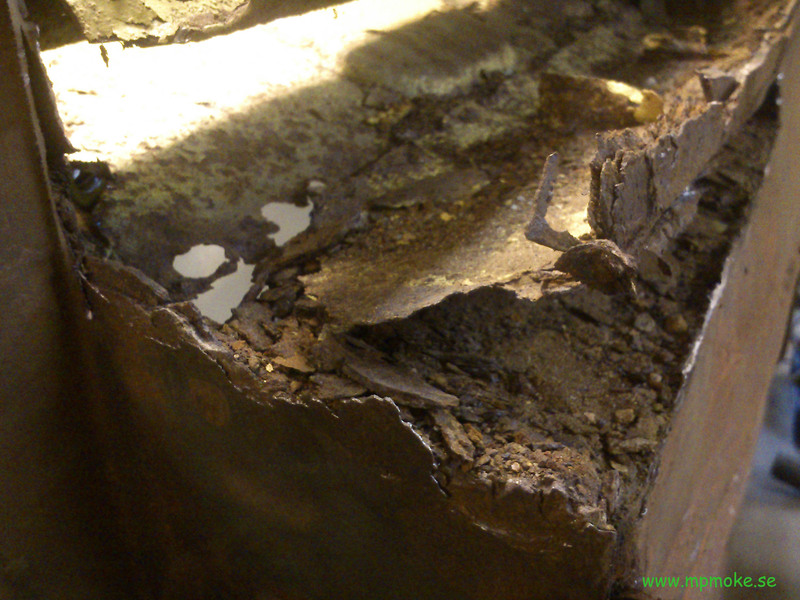 Well, it´s coming closer and closer, the day I will have to deal with this rusty part. 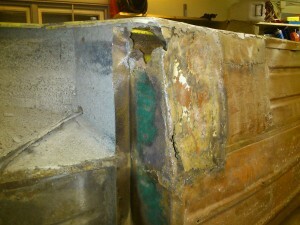 The mounting for the back subframe is rusty, very rusty! As it is by the battery I guess the rust comes from affection from both outside(dirt, salt and water) and inside(acid). The rust has spread along the floor and the “hidden triangle” in the structure of the floor and “pontons”. I looks like it is hard to patch. I guess that I have to cut all the rusty details and some extra away and then start to build it up from scratch. I am not the most skilled metal worker in the world but lets give it a try! The rear subframe must be used when putting it all together so the holes for the mountings comes in right place. That also means that I have to get the Moke of the BBQ-spit and support it in some other way, as I have used the rear montings for the subframe to screw the BBQ-spit to the body. I´ll be back with reports…. This entry was posted in Technical and tagged BMC, Moke, rust, subframe on February 22, 2014 by admin. I had some subframes for the Mini Moke lying around. They were not that rusty so I intended to restore them instead of buying new ones. I washed off the dirt, scraped of the loose paint and rust, grinded them and then cleaned them with thinner. When it comes to painting I was looking around for some good paint and realised there are som many different to choose among. When I restored the subframes for the other green African Moke ten years ago I used paint that still works and keeps the rust away. That paint was Hammerite “Hammarlack”. As that Moke is green I bought a can of green paint. This Moke is yellow right now but I don´t what it will end up like when coming to the painting stage. I think it is best to have them black to suit many colours of the body and to be more to the original look. I did the work by hand and with some minor help of a steel wire brush on the motorised drill. Took some hours spread over several evenings but it works as therapy to be in the workshop, listen to radio and work with this. Taking a break once in a while and drink some coffee. If you see it timewise it would have been more effective to leave it to a company that sand blasts and then powder paint it. But then I would have be at work, earning the money that it would cost me. Now I have done it myself and I can afterwards describe the work and people will believe me when they see as it is not perfect, but good enough for me. 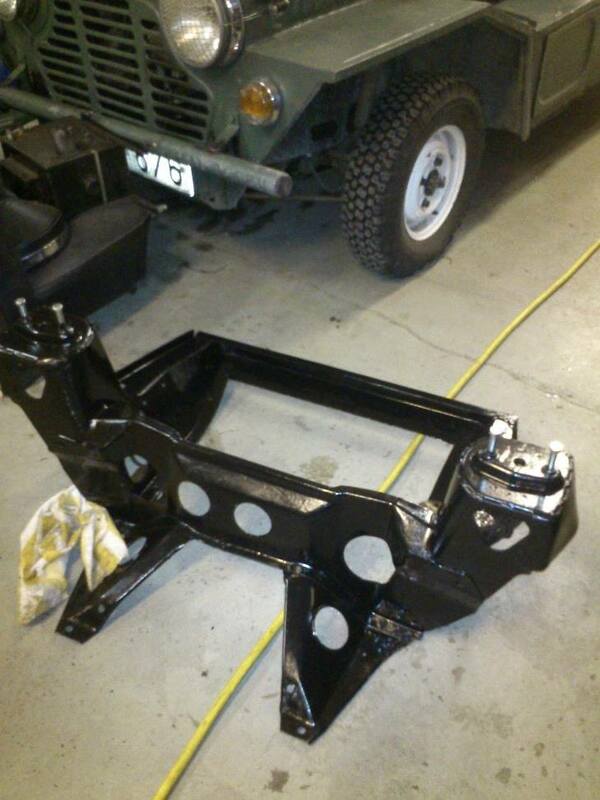 Front subframe with new paint on it. The back subframe is also painted. Now I have to do all the parts for the subframes. Before I assemble them I will repair the mountings on the body and that means I will have to fit the subframes to make sure all the holes for bolts comes on the right place. 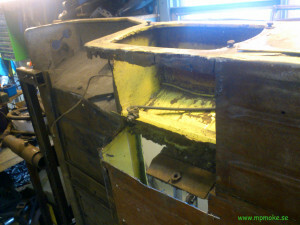 Next time I will start upp the grinder and cut out some rusty pieces of the body. This entry was posted in Technical on February 14, 2014 by admin. Thick arms = more muscles? 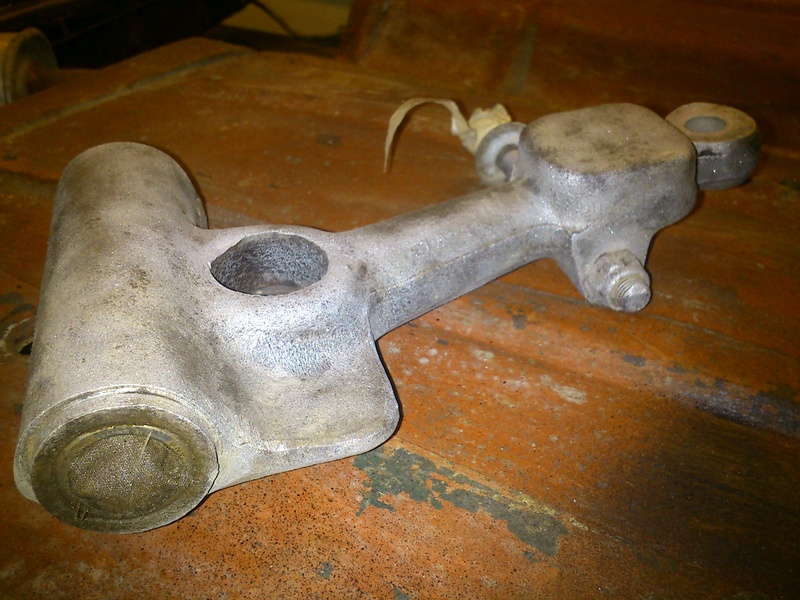 I have started to restore the parts from the disassembled subframes for one of the Mini Mokes. Most parts are the same for a standard Mini but when it comes to the upper trailing arms from the front subframe there is a difference. Look at the picture and see! Yes, after a while you may see the thicker piece, just where the shocker is mounted and where the rubber hits to stop the suspension go to the bottom. This must be to make the ground clearance bigger. Useful when going offroad with the Moke. My plan for all the parts of the subframes is to get rid of old dirt, clean them, paint them and change worn parts. Then I have some clean parts to mount, much easier to work with and looks nice. When the the subframes are assembled again they can be mounted on the body so I can get a rolling shell. This entry was posted in Technical on February 3, 2014 by admin.